Just as travel broadens one's perspectives, so can music. 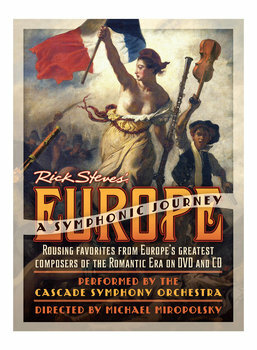 Rick Steves Europe: A Symphonic Journey is an hour-long concert and video special. Rick teams up with his hometown (Edmonds, WA) Cascade Symphony Orchestra on a musical tour that starts in the US, then touches down in seven different European countries. The Booklet: This colorful 24-page supplement includes articles by Rick Steves' Europe 101 co-author Gene Openshaw on 19th-century European Romanticism, Nationalism, and the great composers and music from this era. You'll also learn the story behind this innovative collaboration between Rick Steves, Music Director and Conductor Michael Miropolsky, and the Cascade Symphony Orchestra.